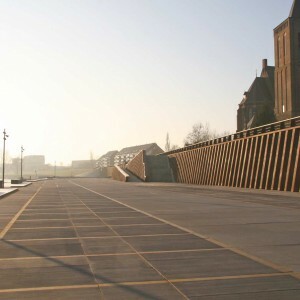 Buro Lubbers: In the heart of Eindhoven, at an important traffic junction, the Light Tower is situated. It is a striking building that is a recognizable symbol of the city. 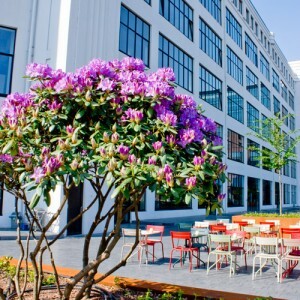 As the former Philips building, an industrial monument, it has always played a prominent role in the iconography of Eindhoven. Recently it was transformed into a luxury residential and office tower. 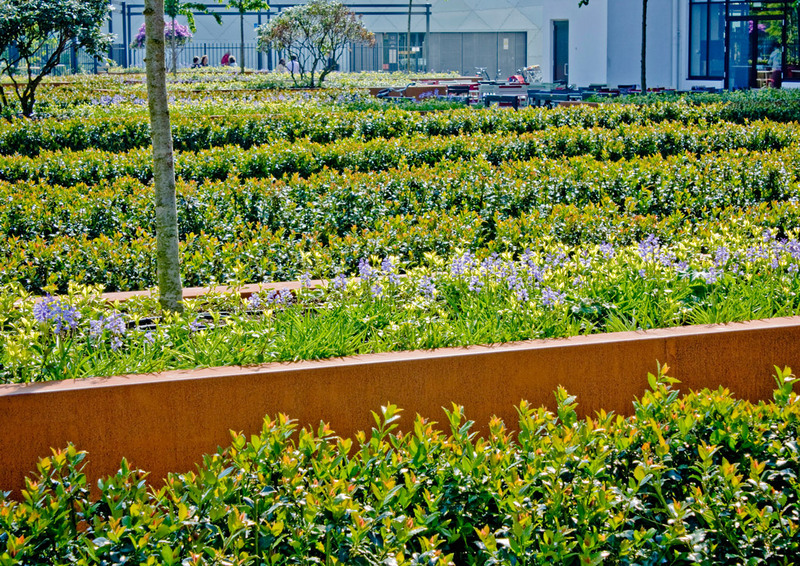 Whereas before the building’s exterior space did not have a significant public function, Buro Lubbers transformed it into a green, tranquil square. 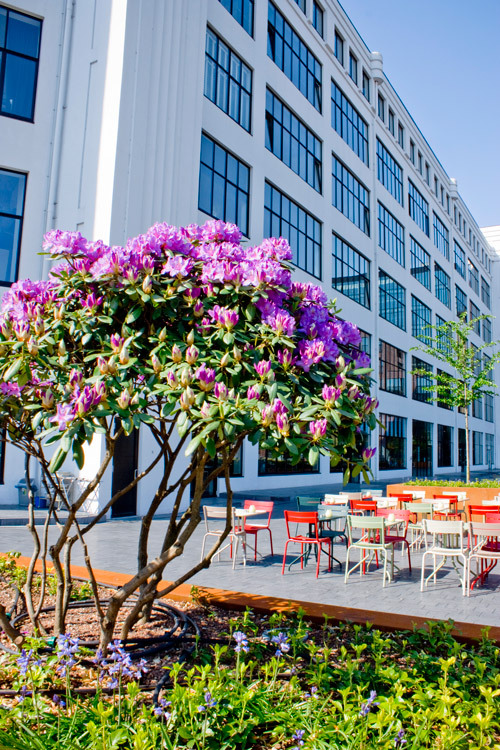 Here, after shopping or a long day at the office, one can quietly enjoy a drink on the terrace or sit down on a bench among lush plants to escape the frenetic activity of downtown Eindhoven. 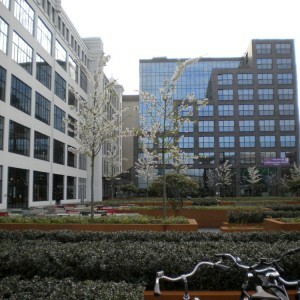 In its own serene way the new square highlights one of Eindhoven’s major icons, the Light Tower. 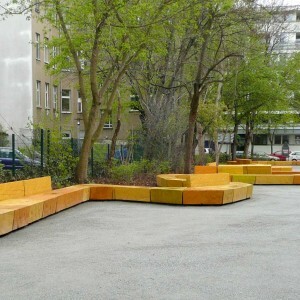 Versatility guided the principles for the Mathilde Square. 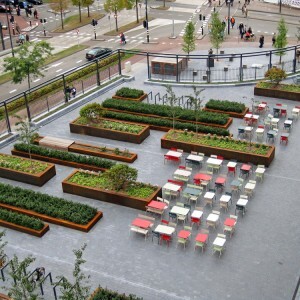 The square had to add value to the series of public squares and places in Eindhoven’s inner city, including the Piazza, the Station Square and the 18 September Square. Besides, the monumental Light Tower deserved to be showcased by means of an outdoor space. 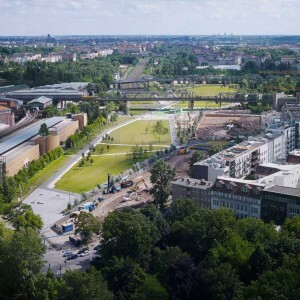 Furthermore, the semi-public square needed to host different functions: an entrance to the homes and businesses in the tower and a drive in for the hotel, terraces and bicycle sheds.Above all, it had to become an attractive place for both residents and passersby. An interesting technical condition was the square’s location for more than three-quarters atop a parking garage. The amorphous form of the planning area demanded an exacting structure that brings serenity and also guarantees an optimal view of the Light Tower. The design concept is therefore based on rigid lines that run counter to the building. A feel of human scale is the result. 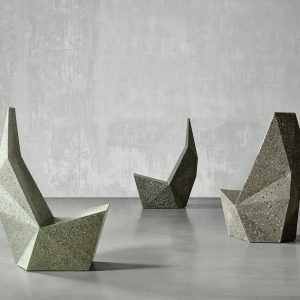 The unity of the design is accomplished by using consistent shapes and materials.Thus the surface is paved with just one material: a dark gray concrete slab resembling natural stone. 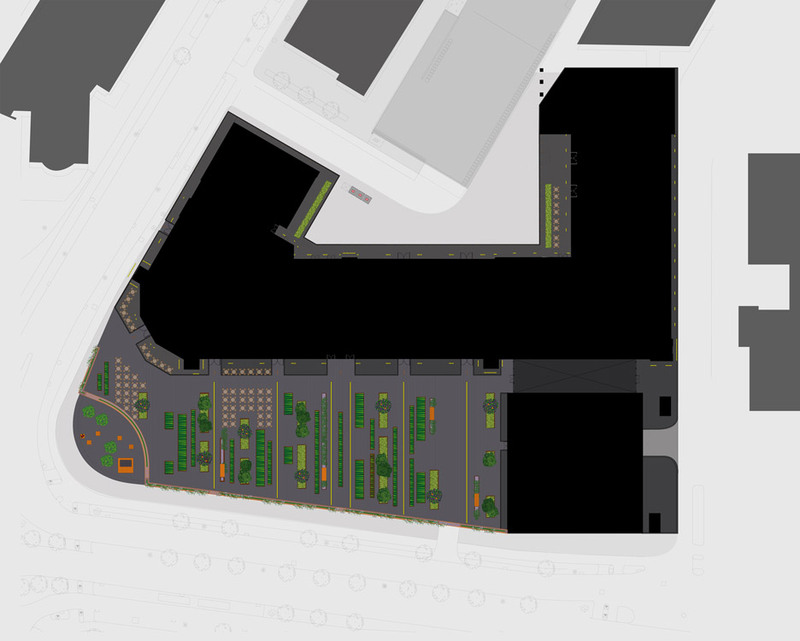 This gray carpet is laid in a rigid, complex pattern and is surrounded by a plinth that distinguishes the square from the building and also highlights the difference in level between the parking deck and the environment. 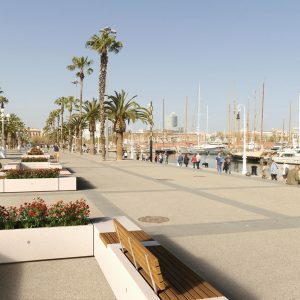 The square becomes an enclave with its own distinctive identity. The difference in level distinguishes between on the one hand the hectic city life and on the other the intimate and green area of the square.These divergent worlds are also emphasised by the fence around the square,which serves mainly as a security measure.Wisteria and roses overgrow the adjacent pergola and create a transparent barrier, offering passersby a glimpse of the green atmosphere and the terraces. 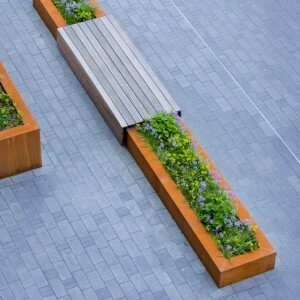 Elongated Corten steel planters create a stripe pattern.This produces alternating open and closed spaces, suitable for routing and terraces.The stripes of varying length, width and height integrate wooden benches and bicycle stands. 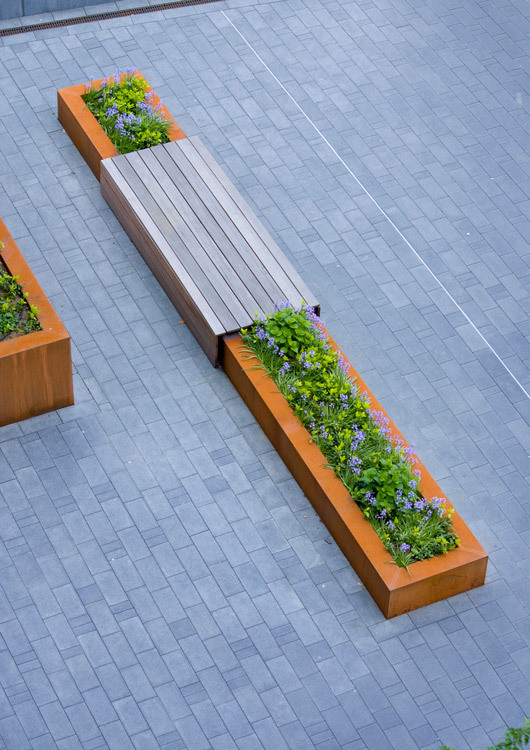 The strips on the square are formed by elongated Corten steel planters of varying length, width and height. 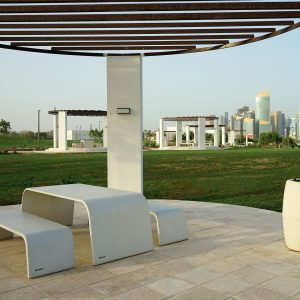 This produces alternating open and closed spaces, suitable for routing and terraces. 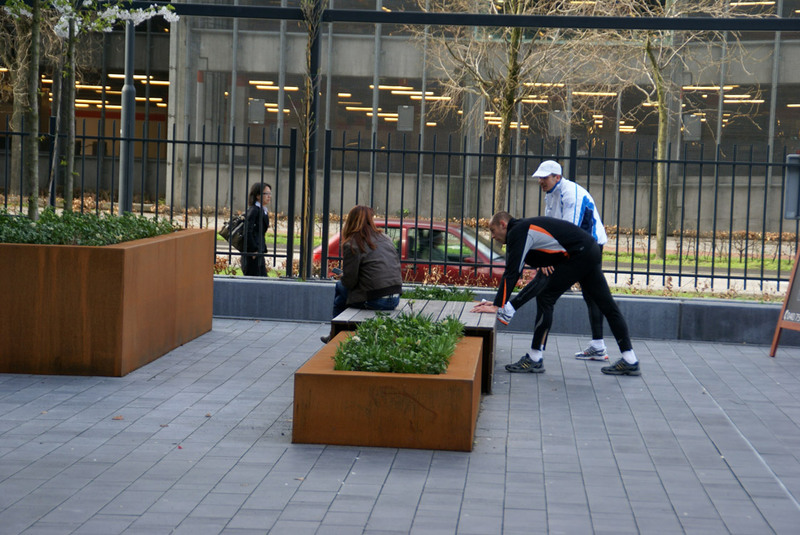 At several spaces between the containers,wooden benches and bicycle stands are positioned. 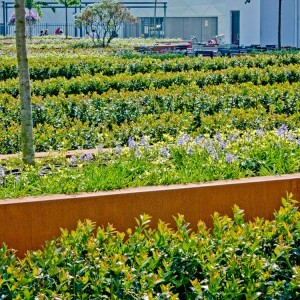 The robust colour of the Corten steel, the warm look of natural wood and the gray pavement, form an interesting contrast to the white, gray and black tones of the building.The most striking colour accent, however, is the vegetation. In all seasons the hedgerow structure of evergreen plants and seasonal flowers will result in an attractive image.Rhododendrons in containers are high green accents. 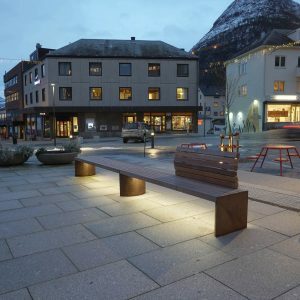 Even at night when the plants are illuminated from below, the Mathilde Square is an inviting, friendly place. 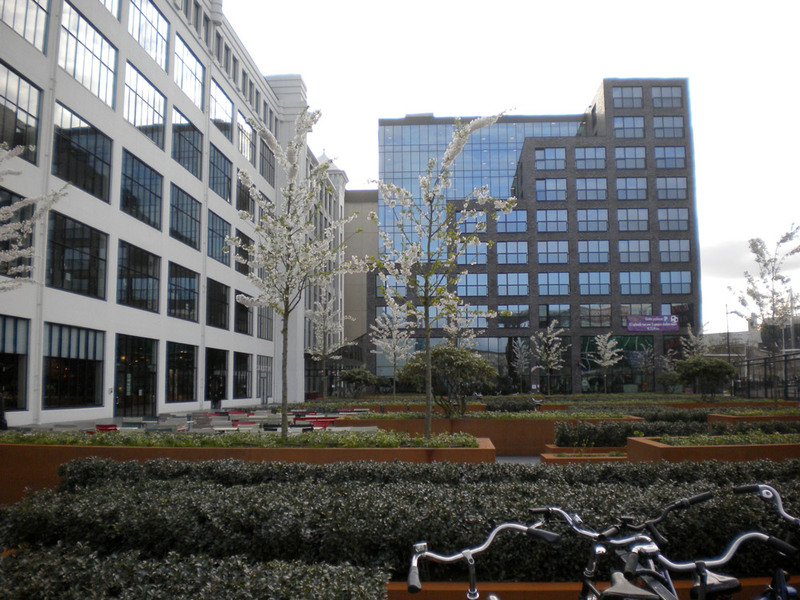 Mathilde Square was a challenge not only in terms of its design and urban integration requirements, but also in its demand for technical finesse. 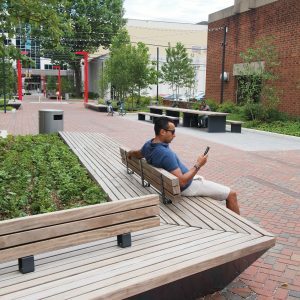 Located on the concrete deck of a parking garage, there was little space between deck and ground level for drainage, the paving and other engineering structures. Another technical condition that influenced the design: the square had to be kept clear for emergency services. Moreover, the additional load of emergency services dictated the location of the heavy planters on the deck. Despite the limited construction space an ingenious drainage system is realised. Through lined gutters in the pavement and drainage mats beneath, rain water is transported to the pergola planter on the square’s perimeter. Excess water is then routed to the municipal drainage. 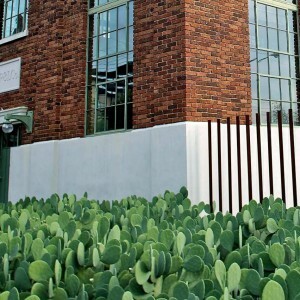 Because the water is collected on one side, the square is placed on one ear, which means that within the limited building space a sufficient but subtle slope is constructed. 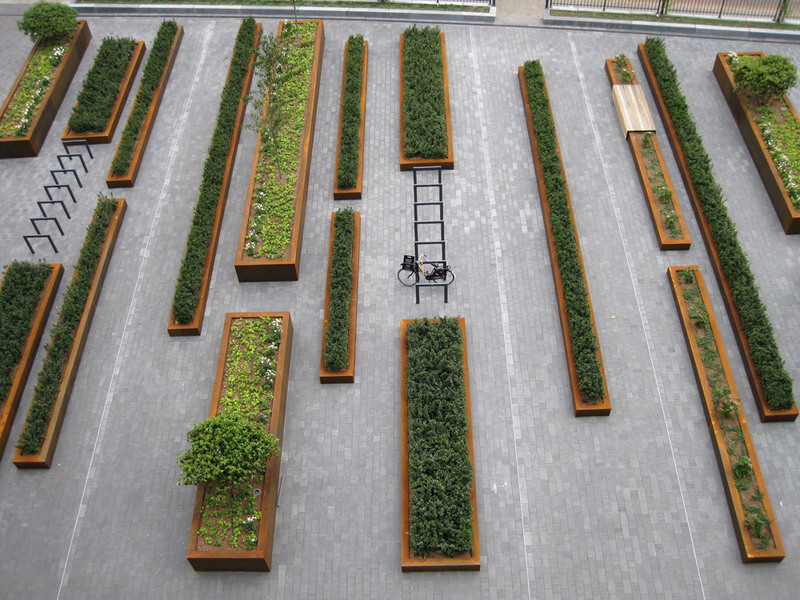 This construction influenced the direction of the planters, which are positioned in such a way that the water drains between the strips. The benefit of the drainage system is that the municipal drainage is less burdened. 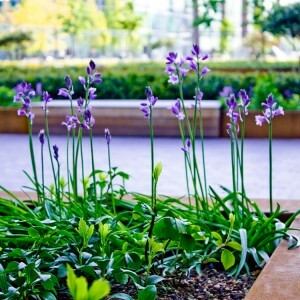 The rain water is not used to irrigate the plants, rather, a sophisticated labyrinth of drip hoses is constructed in the planters. 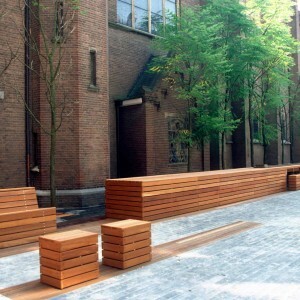 In their turn these custom made planters were crucial for the choice of the pavement: concrete tiles with a natural look. 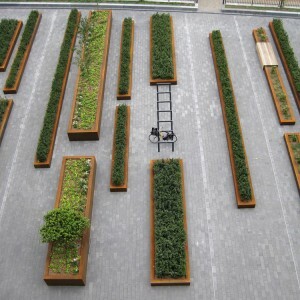 The width of the tile corresponds to the size of the planters, thus the length is always a multiple of the width. Because the size of the planters and the tiles are in balance, it is not necessary to cut tiles to size. 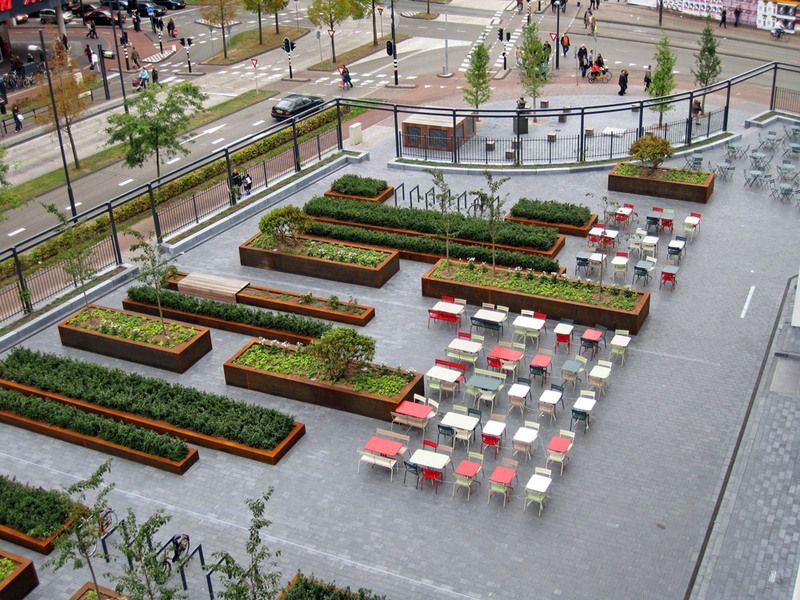 Consequently, despite the wild pavement pattern, the planters and tiles fluently integrate. This peaceful image is reinforced by the skirting around the building. The plinth is not merely an aesthetic, but also a technical decision. Before the reconstruction of the Light Tower, at the site of the plinth, a series of skylights were positioned. 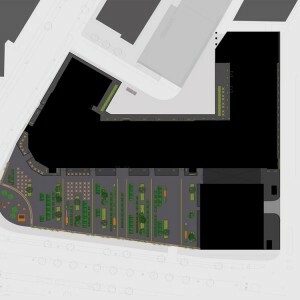 Without function for the new parking garage and lifted to ground level, it was necessary to close the lights. 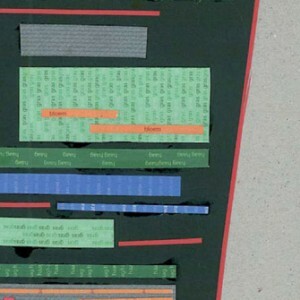 The plinth is now showing a trace of this history. The hedgerow structure of different plants results in an attractive image all the year round. 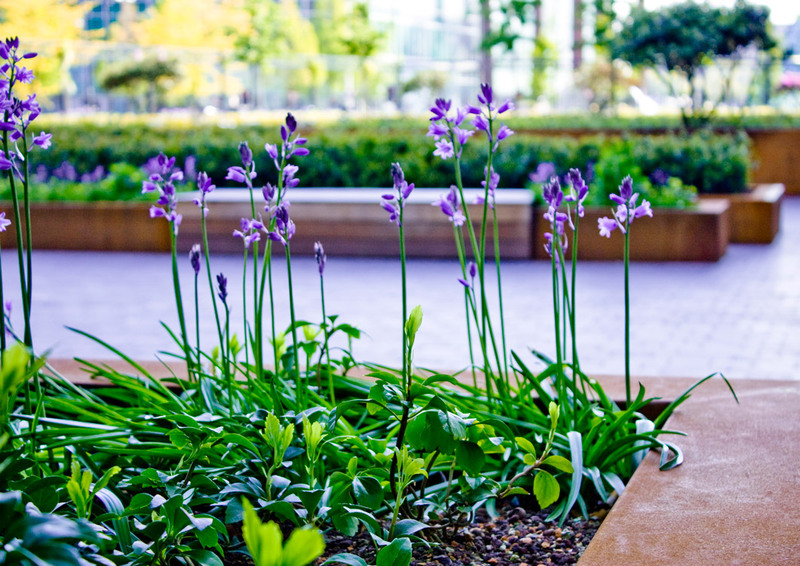 Seasonal flowers add colour to the square. Rhododendrons in containers are high green accents.